Amy Isabella b. abt 1869 in Charlton Co. Ga.. Nothing further is known about her. Her mother's 1900 census entry indicates that all 7 of her children were still living. John Norfleet Todd b. Feb 1872 Charlton Co. Ga., d. 8 Jan 1956 Coffee Co. Ga.
m. 15 Sept 1899 Coffee Co. Ga.
Ella Jane Spivey b. 13 Jul 1885 Laurens Co. Ga., d. 7 Nov 1922 Coffee Co. Ga.
Ella Jane was the daughter of Spencer Ware Spivey and Cora (Lacora) Jane Hall. 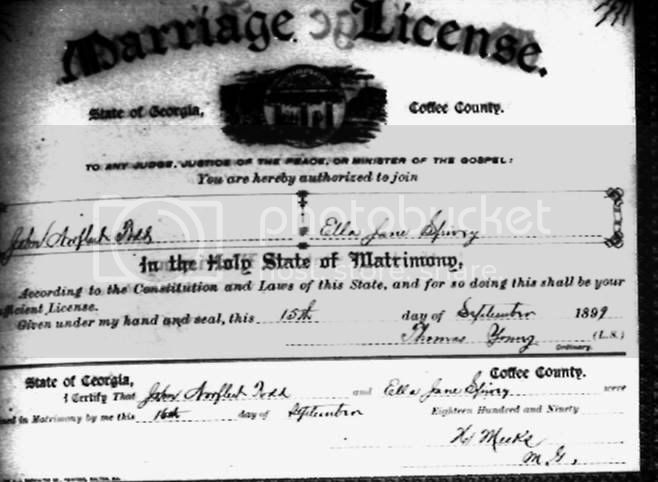 Image of their marriage certificate, courtesy of Georgia's Virtual Vault/Georgia State Archives. Ella Jane's death certificate at Georgia's Virtual Vault. John N. Todd, 83, passed away Sunday, Jan. 8 at the home of his daughter, Mrs. Jim Spell, on Route Two, Nicholls. he was a retired farmer and a member of the Rocky Pond Church. Funeral services were conducted Thursday at Salem Holiness Baptist Church near Douglas with Rev. N. H. Howard and Rev. Roy Gaskin officiating. Music was furnished by the Coffee County Quartette. He is survived by four daughters, Mrs. Fisher Anderson and Mrs. W. G. Soles of Douglas, Mrs. Jim Spell of Nicholls, and Mrs. J. W. White of Waycross; three sons, Manning Todd, Mitchell Todd, and S/Sgt. Thomas Todd, and a sister, Mrs. E. M. Harrell of Savannah. Interment was in Salem Cemetery with Sims Funeral Home in charge of arrangements. Pallbearers: Grandsons: J. W. Joiner, Spencer Joiner, Ivey Joiner, Robert Joiner, Junior Soles, Jesse Anderson. Honorary Pallbearers: Albert Malcolm, Elder Larry Leroy Carver, Jewell Minchew, Dr. Calvin Meeks, Comer Kitchens, Will Kirkland, Tom Butts, Warren Kirkland, Joe Merritt, T. J. Kirkland, Randall Kirkland, Joe Hanna, Clyde Rollins. Manning b.21 Feb 1906, d. 24 Mar 1984 Fl. m. Alice Jean Hirt b. 22 Mar 1901 Butte, Mt, d. 5 Jul 1971 Fl. Both are buried at Osteen Cemetery; Volusia County, Fl. Maggie Viola b. 8 Nov 1919, d. 1 Nov 1938. She is buried at Salem Cemetery, Coffee Co. Ga. Both are buried at Osteen Cemetery, Volusia County, Fl. They are found in Charlton County in 1900, Clinch County, Ga. in 1910 and 1920, and Volusia County, FL in 1930. It appears her daughter, Thursey's family remained in Georgia when they migrated to Florida. Miriam and Eva may be the same person. According to a forum post, her middle name was Mire. Though there is no record of the marriages, by some accounts, she was also married to a Carter and a Layton. More likely, the Carter and Layton children were born out of wedlock. There are a couple of Charlton County Herald extracts at Okefenokee Press about Ezekiel Layton visiting with his sister, Mrs. Isabel Crews while on military leave. I couldn't locate Emma, Isabella, and Ellen in census records after 1910. Albert and Ezekiel Leighton (sic), ages 15 and 12, are in the household of Jacob C. Carter in Charlton Co. in 1920 as "adopted sons." Thanks for all the great research. I also enjoyed reading about the Todds!